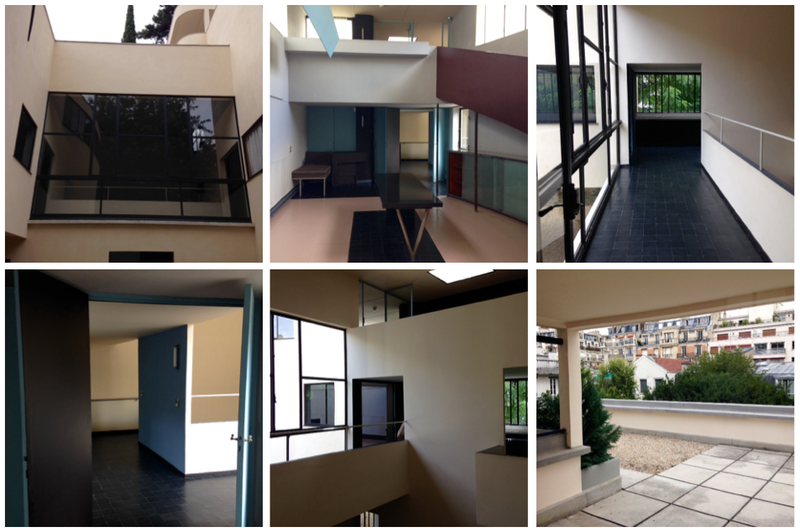 On a long weekend break to Paris I was inspired to visit two buildings by Le Corbusier after reading about one of them on Cate St Hill’s brilliant blog. 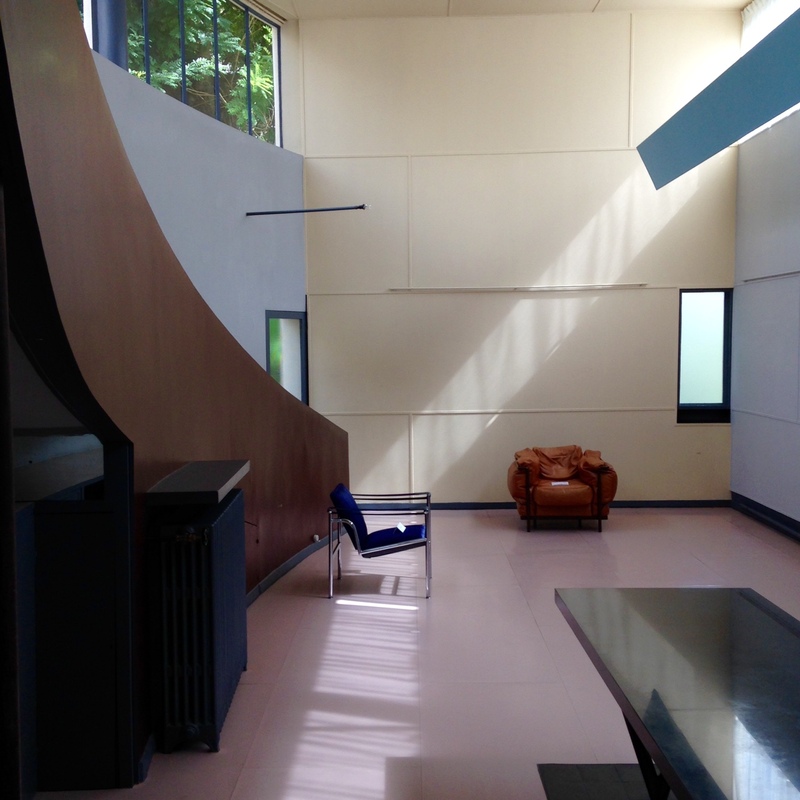 The first building is now fittingly the headquarters of Fondation Le Corbusier; Maison la Roche. The building came about when Le Corbusier’s friend and Patron Raoul La Roche commissioned a house with a gallery to accommodate his family and his collection of art. Le Corbusier was 36 years old and whilst hugely committed to designing housing for the working man he also enjoyed these one-off commissions and undertook this project between 1923 – 1925 alongside Pierre Jeanneret. It is an experimental modernist home built for an art collector on a challenging site (small, at the end of a cul-de-sac, north facing and with strict neighbourhood regulations so not what you would call ideal) and importantly with a need for natural but indirect light. However they used these restraints as the building blocks and then added so much more with a cantilevered balcony, a huge sweeping curving ramp taking you from one level to the next, a roof garden and double-height spaces revealing themselves as you explore it. This lends a playfulness to the house as its split over three layers either side of a double height entrance and affords views across the house – I’m sure hide and seek would be a riot there! It’s quite unlike any house I’ve ever visited but I can imagine the artwork sang in such an environment – and is a very clear example of Le Corbusier’s idea: ‘It is as we walk, as we move along that we see the architectural layout unfolding’. The lack of furniture and paintings was a double-edged sword when it came to exploring the house. Much of the household items have been donated to museums leaving many of the rooms stark except for the fixed built-in furniture, the odd chair and some fascinating framed photos of the rooms as they were originally. However its remarkable to see the bones of the structure and appreciate just how daring the architecture was without the distraction of belongings. Raoul La Roche did not want his house to appear ostentatious and this has been achieved despite its dramatic appearance. The straight walls play with the curved walls, an internal cantilevered balcony pops out and light shafts play across the floor – it is a wondrous tardis to explore. 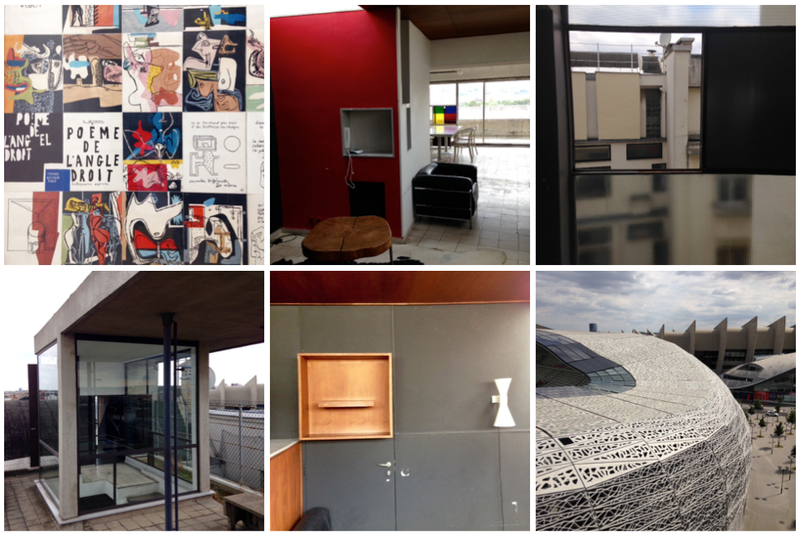 It also very clearly showcases Le Corbusier’s architectural language where space, surfaces and light speak volumes. 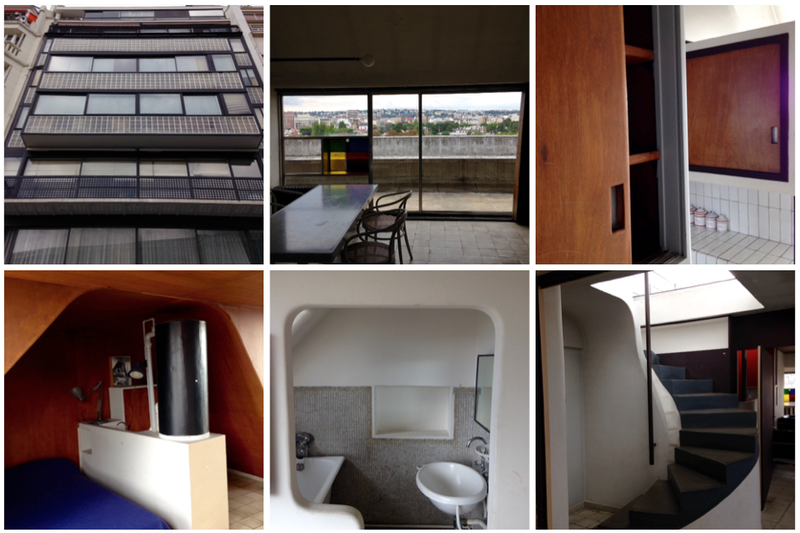 The second visit was to a studio apartment that Le Corbusier designed and built with Pierre Jeanneret between 1931-1934 to be his home and art studio. The ‘plot’ was the top two floors of a townhouse building (on the 7th & 8th floors which let me tell you is a humongous climb up a narrow claustrophobic spiral staircase!) but this height affords a breathtaking double aspect outlook east and west across Paris. The Bois de Boulogne area is famous for sports with large stadiums dominating the local landscape and beautiful woodland so this spectacular 360 degree view was rightly maximised by using huge glass panes on both sides of the apartment and a roof top terrace. The first thing you note is how well thought out and bespoke the space is. The 240m2 apartment uses a system of vaults and each functional area is divided by moveable elements such as oversized pivot and revolving doors. This makes it possible to be one long large sociable dual-aspect space or intimate little rooms – it also adds a sense of drama to the space! Even the bed is elevated on stilts so they could lie in bed and look over the parapet across at the view and pared back industrial lighting comes from the side walls rather than from above to give clean lines to the arched ceilings. The proportional division of space utilises every nook and transforms them into a study corner for writing and making calls, storage spaces, and a guest room at the top with access to the roof top terrace – both with enviable views across to the Eiffel tower. What you also notice, is that 10 years on from the first building and Le Corbusier is using more sinewy organic shapes in his spaces out of plaster and plywood. His use of primary colours (and a lot of grey) throughout each space give each room a purpose and boldness. The plywood clad walls and ceilings have such character and the kitchen could easily be one designed today and featured in Dwell with its beautiful carpentry and white, wood and grey palette! The art studio part of the apartment continues in this theme, glass blocks refract light to reproduce the Mediterranean light of his travels and wooden panels on the east side control the morning light for painting. There is a sense of built-for-purpose and quality about the space. It’s exciting, open, quirky and the roof terrace is a shock for the senses looking out across the whole of Paris. 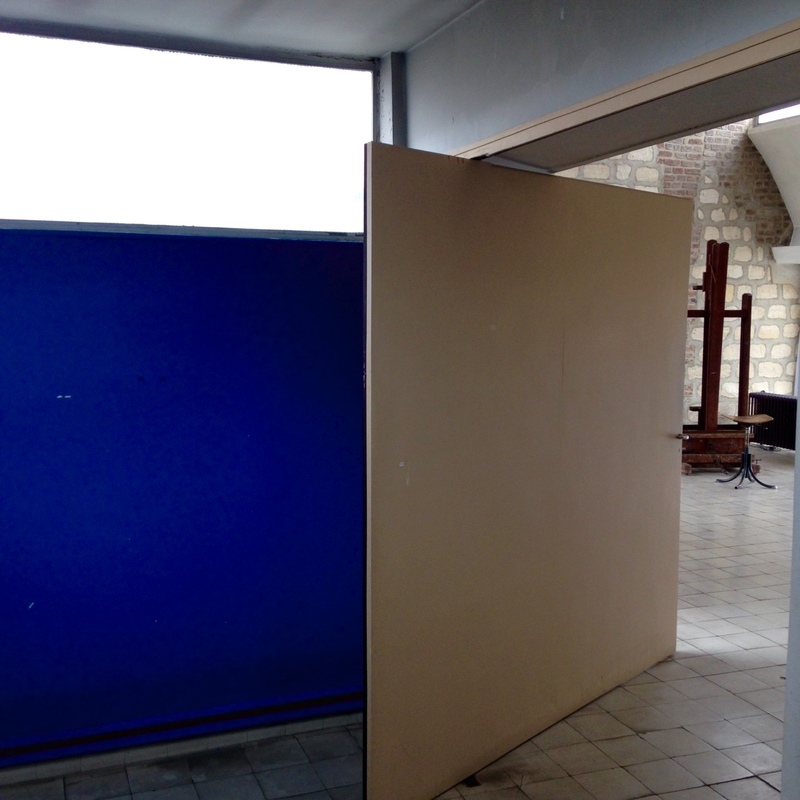 It’s clever and was no doubt an amazing space for creativity, wellbeing and the purpose of its end user; Le Corbusier. If you would like to visit these beautiful buildings then look up Foundation Le Corbusier for all the information you’ll need. There are others on our list to see at somepoint: Swiss Pavilion which was the starting point for his research into ‘a machine for living’, Brazil Pavilion which has those amazing coloured balcony reveals (à la Unité d’Habitation) and Villa Savoye which needs no introduction. If you make a visit to these then do let us know – we’d love to hear all about it! Previous article Maison & Objet Paris 2015 | Our top Five!